A Hokkien people like me must serve this tradition dish -Mee Sua when celebrating Birthday, my mom also taught me to add chives in Mee Sua as Hokkien people believes chives bring longevity! 1. Get ready the chicken stock or ikan bilis stock. 3. Use the remaining oil, add the sliced meat and mushroom and stir fry for 2-3mins, set aside. 4. To make the individual portions of mee sua, ladle some of the stock into a small pot and allow to boil. 5. 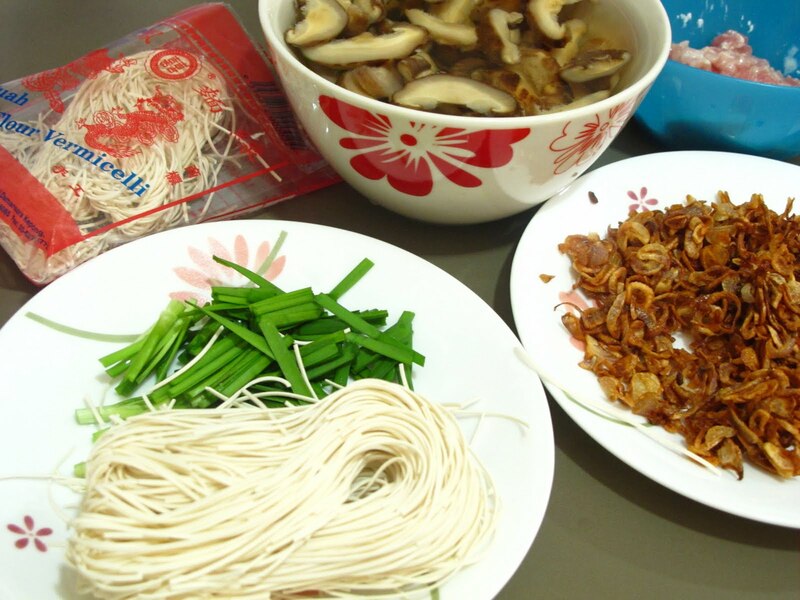 Add a bundle of mee sua and let it cook for 1min or till soft. 6. Add in the meat and mushroom, chives and stir well. Seasoning with salt and pepper. 7. Pour into a soup bowl and top with fried shallots and hard-boiled eggs. My note- cook Mee Sua just before serving as the flour vermicelli turns soggy quickly! wow! i love this especially with chinese sweet wine. hehe...confinement best food. I actually like soggy mee suah. Sometime I let the mee suah soak up all the broth before eating it. Not red colour and the Mee suah looks so different also. Hi morning Sonia....I would love to try out the recipe....used to...cook mee suah for my babies when they we little...learning to eat solid food....This time I will cook it for me..once I buy the mee suah.TQ for the recipe! I seldom eat mee suah but this bowl of mee suah looks so delicious. Must bookmark it! my mum will cooked this dish as a birthday meal. Wow! This is a very generous bowl of mee suah. Fill up to the top with lots of fillings. There is no way to get something like this from the food stalls. Homemade is the best! Mmm, interesting, nevet thought of adding chives to mi sua....next time I will try! MMM. Really interesting. I like mee soto ayam the most.Nice click too. Love to hear ur comments too in my blog. I would love to try this...great photos too! Love it when it turns soggy lol, very delicious. Happy birthday to the birthday boy! I love mee suah. We were brought up eating a lot of mee suah because of Chinese belief like you. I love it in soup. Your mee suah here looks really delicious. e always had to eat 2 eggs if it was our birthday. I don't mind that cos I love eggs. Did you know that I've never had mee suah for birthdays. Hehe probably because I'm not Hokkien. But my hubby has and it would usually be plain with a hard boiled egg. I love mee suah soup, the noodles are usually so smooth and easy to slurp down. This bowl sure looks damn good! Its new to me...Looks delicious..
Hey Sonia, I cooked that for my hubby last year's birthday too....hee hee!...Yea, he's hokkien but last year was the 1st time i cooked for him...haha! My mom cooked mi suah for us on our birthdays when we were growing up, but I have never cooked it. We'll also get a big drumstick to go with it, two red eggs and an ang pow. I must carry on this tradition... starting with learning to cook this. 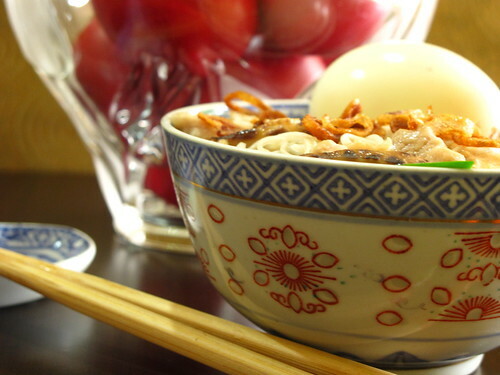 I may have a really big sweet tooth but I love these fragrant soupy noodles! And the crispy onion slices on top. YUM! Mee suah + chives , a very special combination ! I like to eat Mthe mee suah ! Never knew that chives signifies longevity. I never like soggy mee sua, so I'll blanch them first in boiling water, then only add the soup, meat etc. 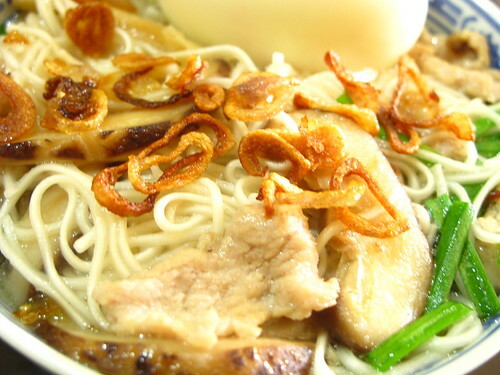 Some Hokkiens serve sweet mee sua, do you? This noodle bowl looks tasty. Thanks for sharing the idea. This dish is just lovely! Every time I visit I leave so hungry!!! Shame on you!!! Love this!!! Always listen to Mama.May you eat this dish and live long! I love mee suah too! The chives can clean away the toxic build up in our body, so eating chives is really good for us. What a wonderful looking bowl of soup! Love the way the egg is perched on top. So delicious! Lovely bowl of soup and tasty and easy to make as well! I feel like having some RIGHT NOW! I always try to have long noodles (for long life) for birthdays but thank you for the tip about chives for added longevity. Actually, the egg is new to me but I would love to try it as well. This soup looks marvelous! This is a very typical Hokkien dish. My mum used to cook this with the red eggs for my dad's birthday. wow I wish I could have one bowl of this! Looks super delicious! Ok now I want some! My mom used to make this all the time. Haven't had it in awhile though. LOve this Mee Suah.. Awesoem and tempting Clicks..Good info abt adding chives for Longetivity...Before I forget..Happy birthday to ur son Lucas. He must be so happy with all this traditional b'day food..Also love ur last post abt the red eggs. They look awesome. 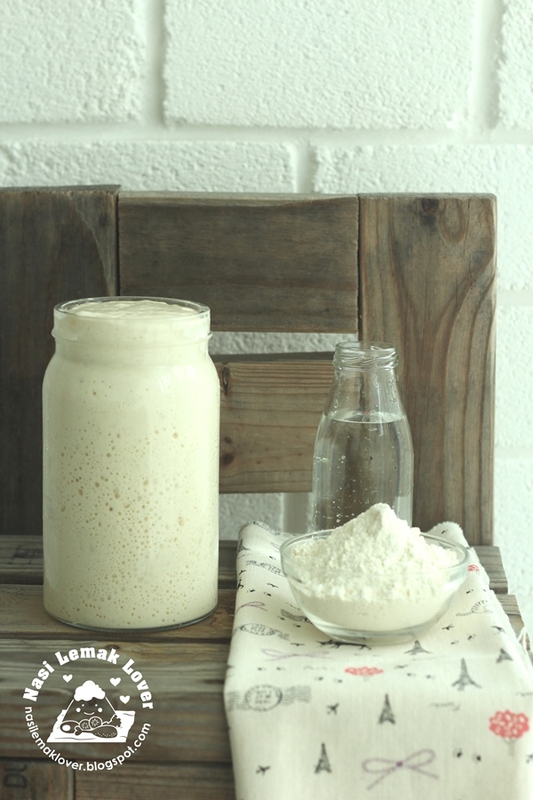 I'll try this recipe soon. Stumbled upon your blog and found out we are actually living in the same town! Love your blog especially about cari makan in Klang. Keeping a lookout for those eateries you have mentioned. This meesuah dish lookes awesome too! Haven't cook this dish for a while now. oh wow, that soup looks delicious! wow! your mee suah really look heavenly delisih!! look like the one my mom cooked!! just looking making me drooling big time!! dear all, Thanks for stopping by. Cheah,sweet mee sua is new to me, I never seen my mom cooked this before, must check with her about this. J.O, i have replied in my Red eggs post, check it out. The mee suah looks so good! I like it! 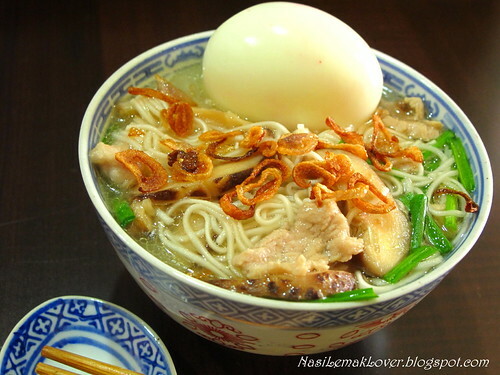 Wahh..I'm salivating looking at this bowl of Mee Suah! Never quite a fan, but I actually miss it as I look at your yummy pic!! I love this dish though I ain't Hokkien! And I've never had mee suah on birthdays! Maybe I ain't Hokkien, too!!?? That bowl of noodle looks scrumptious! !